Elementary students have a better chance of showing what they’ve learned when they have a choice about how to show it. Most classrooms are filled with students of varying academic abilities. Even within a gifted and talented classroom like mine, the ability levels can range drastically. As teachers strive to meet each student’s individual needs, differentiation is key because it’s about giving more opportunities for students to grow to their highest potential, and it is beneficial for all students. In the digital era, we can provide all of our students with technological ways to enhance their learning, no matter their academic label. Every student is different and needs to be offered a variety of ways to show what they’ve learned in a way that reflects their individuality. One way to differentiate within the curriculum is to provide students with choices for completing an assignment. Students learn in various ways, and we can let them show their learning in various ways. When I give my students a choice on how they’ll complete a project, they have to meet certain criteria, but I allow them to find an outlet they find most enjoyable, such as creating a Google Slides presentation, a trifold board, or a pamphlet. Giving students a choice allows them to take ownership of their learning as well as create a product that feels authentic to them. They work on something that they’re good at creating, or try something they want to get better at. An excellent way to ensure differentiation is to have each student create an e-portfolio—a technology-based assessment tool that collects a student’s authentic work samples, providing a quick way for a teacher to assess growth and skills. In a sense, the e-portfolio is a window into a student’s learning, one that allows the student to choose what to include. An e-portfolio can follow the student across grades, too. And once the time is spent creating one, the process of adding content becomes easier and quicker as the student adds to it in later grades. Since e-portfolios offer a way for students to show authentic learning, they allow students to exhibit their individual growth through their academic experiences. The best way to differentiate instruction is to give students a choice in how they show their learning. All students learn in their own way, and they need to be able to show their individual skills and interests. As long as they’re able to demonstrate a certain skill, assessment should be more about the process than the product. Giving choices may seem like more work for the teacher, and it can be, but it’s also worthwhile because it encourages more students to take more ownership of their learning. 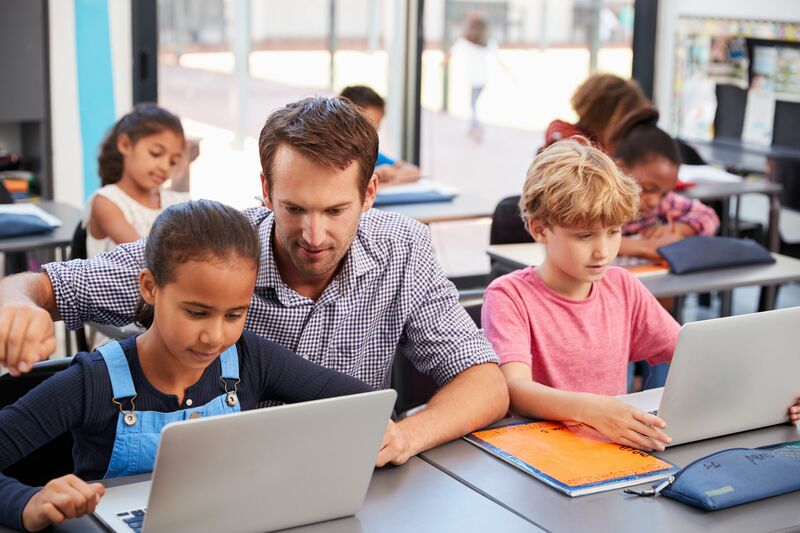 Adding a technology component to an assignment can drastically increase student engagement, especially if they haven’t been given such options in the past. Using a novel app, such as Flipgrid, adds an element of fun while also giving students practice with tech skills. But technology is not the only way to provide choice—try using choice boards, which provide students with many options for presenting content. Students may present the water cycle stages in a song, for example, or create a comic that lays out those stages. Such choices can be fun for the students, and can show teachers hidden talents their students possess that they wouldn’t see otherwise. Few applications offer the opportunity for students to reflect on their learning, but pushing students to do that is important in getting them to think about how they learn best and take an active role in their own learning. Quick assessment applications such as Flipgrid and Kahoot allow for student reflection, but the e-portfolio—which showcases an individual student’s personality—is even better. With e-portfolios, students reflect on their learning while putting their own mark on their assignments. Students are able to showcase their learning and the process they used to create their final product while individualizing it with their likes and interests. A teacher may require some items to be present—such as name, class section, pictures of hobbies, or content-related materials—but seeing the ways that students make the e-portfolio their own is what a teacher wants. The e-portfolio is a tool that students can use to express their thinking in a way that is unique to them. Teachers can assess e-portfolios to measure growth and skills instead of just knowledge of course content. Students are able to take ownership of what they have learned, choose how they present the content, and take control of their learning. Differentiating allows students to have their voice heard, which can lead them to become self-motivated learners. And that in turn can help increase both their learning growth and their self-awareness of that growth.